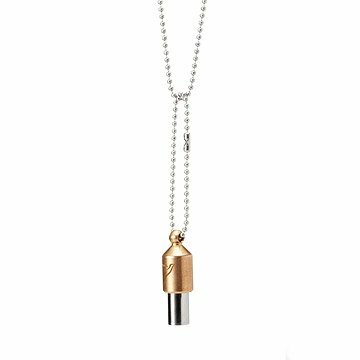 Tuned to the love frequency (528hz), this pendant plays soothing tones as you inhale and exhale. Breathe in, breathe out with this small meditative flute, beautifully designed to be worn as a necklace. This copper and brass pendant plays therapeutic tones with simple inhales and exhales through the mouth. Offering a stress-reducing sensation by focusing on your breath, this soothing instrument is tuned to 528hz, believed to be a healing frequency. Made in the USA. Sigmar Berg is an artist and designer, while Tom Rohner is a light worker—their talents combine to form a truly meditative design. Working together to inspire community, harmony, and loving togetherness, the friends and self-described "soul brothers" created the meditative Love Tuner. 2.8 H x 0.8" Dia. To clean use a musical mouthpiece sanitizer. Brass can tarnish over time. Use polishing cloth to remove tarnish. Necklace chain (27" L) and key chain (5.5" L) included. With 5 kids to homeschool I don't get much quiet time. This little gem has helped make the most of the few spurts of alone time throughout the day I'm blessed with. At first the tone reminded me of a lawnmower, but between the way it helps me focus on my breath and the strange calming sensation it evokes, I'm in love! I was skeptical but curious, and I can't speak to all its supposed benefits, but there's something about it that ignites something within me. It's not magic, but it sure feels nice! I use it to help me calm myself before doing yoga or stretching so I can get the maximum benefit, and it really does the trick. Plus it stays snugly in its holder so I have no fear of it coming loose. I just love it. What a great way to relax and be in a peaceful state of joy. Love it ! The only tuner I've ever considered and the only one I'll ever need. Lovely craftsmanship.